One of the latest news tidbits in MLS is that the San Jose Earthquakes have acquired Uruguayan right back Pablo Pintos (pictured above) from Defensor Sporting of the Uruguayan Primera División. Pintos, a 27-year old who has played professionally in Uruguay, Argentina, Mexico, Spain and Turkey, will head stateside to likely replace injured German defender Andy Gorlitz. The ‘Quakes hope Pintos can help stabilize their defense, although they’re currently 8th in the Western Conference and have no chance to make the playoffs. Either way, Pintos would become the seventh Uruguayan international currently signed to an MLS franchise, which is more Uruguayans than, I think, there have been in the league. Most of them signed this past off-season, which is exciting. In the wake of this influx of talent, I figured this would be a great time for you guys to get to know a few more of my countrymen. If Diego Fagundez sounds familiar to you long-time fans of Jobu’s Rum, it’s because he was the first guy we profiled as part of this Get to Know A Uruguayan series. That was three years ago, when he was just a 16-year old rookie attacking midfielder with the New England Revolution, so I guess it’s about time for an update on young Diego. Like your boy Jobu, Diego moved to the United States when he was five years old. Unlike your boy, however, Diego was snatched up by the Revolution’s academy team (I think they blew it with me because the league didnt’ exist, frankly). In November of 2010, he was signed to the big boy club, making him the Revs’ first ever home grown player. That April (2011), he made his debut as a sub in a 3-2 win over D.C. United in a U.S. Open Cup game, but his MLS league debut came on August 6th, when he drew a penalty and eventually scored his first goal against Chivas USA. Diego has since become a regular in the starting eleven for New England team that is always in the hunt for a playoff position, and has quickly become one of the better young players in MLS. I’ve even had the pleasure of seeing him play live at Foxborough Stadium on two occasions, the latest being just a few weeks ago against Portland. Diego has a bright future in front of him, both domestically and internationally, where he has suited up for Uruguay’s U20 club on two occasions. He should soon become a U.S. citizen, which would also make him eligible to be called up by the USMNT. Right now, it would seem Diego has the skill to basically choose his own future on the international level, and I am excited to see which country he chooses to play for. For what it’s worth, because I’m a both native of Uruguay and a U.S. citizen, I will be happy with whichever choice he makes. 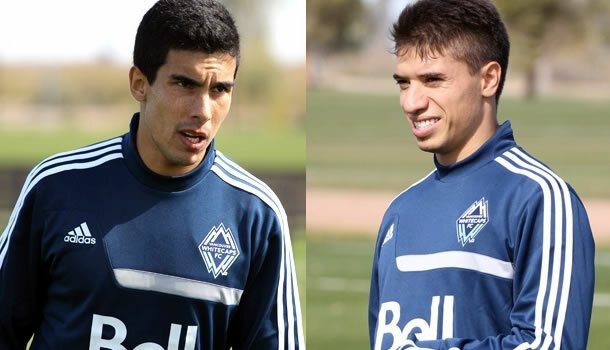 Vancouver really went hard after the Uruguayan quota this November, signing both Nicolás Mezquida and Sebastián Fernández, who had previously been teammates on Boston River of the Uruguayan Segunda División. Mezquida, a 22-year old Striker, was born in Paysandú, and came up through the academy system of perennial contenders Peñarol–Jobu’s most hated club. He eventually played with the big club between 2008-2012, but didn’t make much of an impact, playing in just three games and scoring one goal. During his time with the black and yellow, he was loaned out to Brann and Lillestrøm in Norway. In 2012, he left Peñarol and joined Fénix in Uruguay, where he played 14 games and scored a goal. His best year as a professional was 2013, when he was loaned out to Rampla Juniors (also of the Uruguayan Primera División) and scored 7 goals in 24 games. So far, with Vancouver, Mezquida has played in 10 matches, starting four of those and scoring two goals on 4 shots on goal. Internationally, Mezquida has represented “La Celeste” on the U15 and U20 levels, earning 17 total caps and scoring 11 goals. Fernández, meanwhile, is a 24-year old Striker from the capital city of Montevideo (where Jobu is also from) who started his youth career with Miramar Misiones, where he also played his senior ball. From 2008-2011, he played 66 games for the team, scoring 27 goals. In 2012, he earned himself a transfer to Danubio F.C. of the Uruguayan Primera División. With Danubio, Fernández got into 14 matches, scoring 4 goals, before signing with San Luis of Liga MX. After spending 2012-2013 there, he was transferred to Chiapas, who loaned him out to Universitario, where he helped the club win the Peruvian First Division title. As I mentioned, he then signed with Boston River, who loaned him out to Vancouver. So far with the Whitecaps, Fernández has played in 17 matches, scoring 3 goals on 13 shots, including a goal in his debut with the club on march 8th against the New York Redbulls. Fernández has never been capped for Uruguay on any international level. With the two Uruguayans helping up front, the Whitecaps currently sit in 5th place in the Western Conference, four points ahead of FC Dallas for the highly contested final playoff spot. Godspeed, gentlemen. Vicente Sánchez is, by far, the most veteran of the Uruguayans representing “La Celeste” in MLS. The 34-year old striker from Montevideo has been a professional fútbol player for fifteen years now, and has played in Uruguay (Sud América, Tacuarembó and Nacional), Mexico (Toluca and América), Germany (Schalke 04) and now the United States. He’s best known for his stints in Toluca of Liga MX, where he played from 2001-2007 and scored 85 goals in 242 matches, and Nacional, for which he played in 2001 and from 2012-2013, scoring 6 goals in 34 total league games. El Bolso and I have both spoken about him at one point or another, especially over the last couple of years of covering Nacional. Sánchez made the move to the Rapids and MLS in August, and has become a pretty integral player in Colorado. He has started 10 matches and scored 6 goals on 11 shots on goal. He’s even the main penalty kick taker for the squad, which is currently seventh in the Western Conference, six points behind Vancouver for the last playoff spot. Unlike these other guys, Sánchez has a relative ton of international experience, having suited up for “Los Charrúas” 31 times in his career. He has scored 5 goals in his Uruguayan international career, including 3 in Copa América play (2004, 2007) and 1 in a 5-0 drubbing of Bolivia at Estadio Centenario, in Montevideo, during the 2010 World Cup qualification stages. While we won’t see him suit of for the sky blues again, it’s been fun watching him play over the years, and I’m glad I can watch him in MLS now. FC Dallas recently went on a ten game unbeaten streak, and I’d like to think our next player played at least a little role in it, albeit mostly as a substitute. David Texeira signed with FC Dallas this past February, but he began his career back home in Uruguay, where he came up in the academy system of perennial Uruguayan Primera contenders Defensor Sporting. The now 23-year old attacker played 22 games for Defensor, scoring six goals for the pro club from 2009-2011. In August of 2011, he was transferred to FC Groningen of the Dutch Eredivisie (their version of the premier league), where he played until signing with FC Dallas over the winter. At Groningen, Texeira played 65 games, notching 14 goals for the Green-White Army. That brings us to his time in Dallas, where the six-footer was signed as a young designated player (I think that’s one of those wacky made up MLS rules), and has played 14 matches, starting four games and scoring 1 goal on six shots on goal. Internationally speaking, Texeira hasn’t had much experience. He’s only represented the Sky Blue on the U20 level on some friendlies, and during the 2011 U20 World Cup. Who knows, maybe we’ll see more of him in the future. Finally, this brings us to Santiago González, a 22-year old attacking midfielder for the Montreal Impact. The impact signed González this past Valentine’s Day, under the Major League Soccer’s Special Discovery rule (yes I know, more made up rules), and he’s been playing as a sub for them in his first year in MLS. He started his youth career with Sud América, which is where he also spent the first four years of his professional career. From 2011-2014, González played in 43 matches, scoring 14 goals and helping the squad to a Primera promotion following the 2012-2013 season. 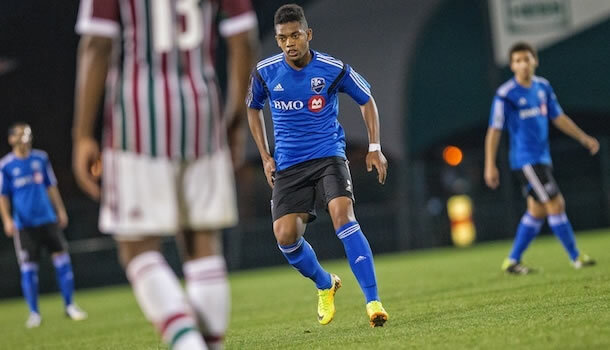 After signing with Montreal, González got into nine games–all as a sub–and was unable to score on three shots on goal. About a month ago, Montreal actually loaned González out to Danubio FC of the Uruguayan Primera Divisíon, where he has scored one goal in three games. It seems the Impact thought the kid needed to get in some games. Hopefully he uses his time at Danubio to take his career to the next level. Internationally, González has only played two matches for the U17 level, both during the 2009 U17 World Cup. Just last season, I’m fairly sure that Fagundez was the only Uruguayan in MLS, and he only sort of counts because he mostly grew up here. He’s not really Uruguayan talent that was discovered and brought over to MLS. If anything, he’s talent from here that has been discovered and brought over by the Uruguayan national team. I know that Uruguayans have had some impact on the MLS, most notably among them Álvaro Fernández (Seattle), Egidio Arévalo Ríos (Chicago), MLS OG Tab Ramos (Metrostars) and a handful of others, but this is by far the largest sheer quantity I’ve personally seen in the MLS at any given time. It’s exciting to me that, right now, nearly ten of my countrymen are signed to MLS contracts, and that’s not even counting any possible American-born Uruguayans, like Agustín Viana of the Columbus Crew. When one is trying to become a new fan of a league, or sport, it’s always fun to feel that you are represented by it’s players and teams. I don’t think it’s surprising, considering Uruguay’s last two World Cups, that more teams around the world would discover the talent that lies within the country’s borders (although, truth be told, it Seems Europe got the memo decades ago), I’m just looking forward to watching the Uruguayan presence in MLS continue to grow. @Jobus_Rum I didn’t even know there were that many Uruguayans in #MLS plying their trade. Nice piece.